To be fair this was a case where the maternal side was well known and documented and all ancestors have deep American roots. 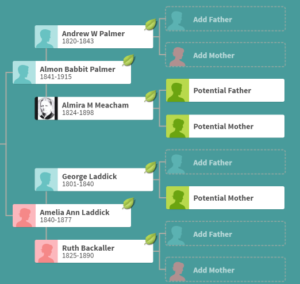 Jack had tested to help his maternal half brother Everett find his Dad but initially had no interest in pursing his own bio dad connection (all names are changed as always for privacy). Recently he decided that knowing his paternal family medical history might be worthwhile so he gave me the go ahead. The names down the side of the page have been blurred out but I could see them and I was immediately struck by the appearance of a specific surname in half the usernames on that big cluster. I knew I had seen that surname in his best match’s tree, a first to second cousin, let’s call her Kate, who is too close to be included in the clustering. 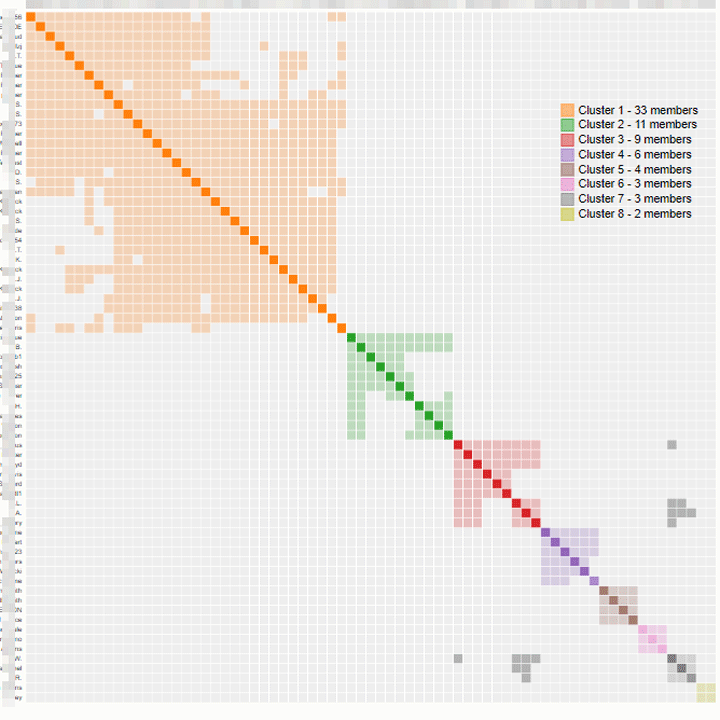 Next I looked at cluster 2, also paternal, in the charts and saw that many of them had good sized trees. So I clicked the three top matches from the charts with trees and took a look at them. Again, one surname stood out. Now can I find someone with surname1 marrying surname2? Those would be his paternal grandparents. Since Kate has a huge tree, I decided to search her tree for that second surname. There were only a few and just one was married to a woman with surname1. Plus they are the right ages to be his grandparents. How quick was that! Next I build him a quick and dirty (Q&D) tree using Kate’s tree, green leaf hints, and those green “Potential Mother/Father” things. Connected his DNA as the son of an unknown son of the presumed grandparents. While waiting for Ancestry to find those DNA ancestor hints, I decided to spot check if the expected relationships agree with his new tree for the relatives in the two clusters. 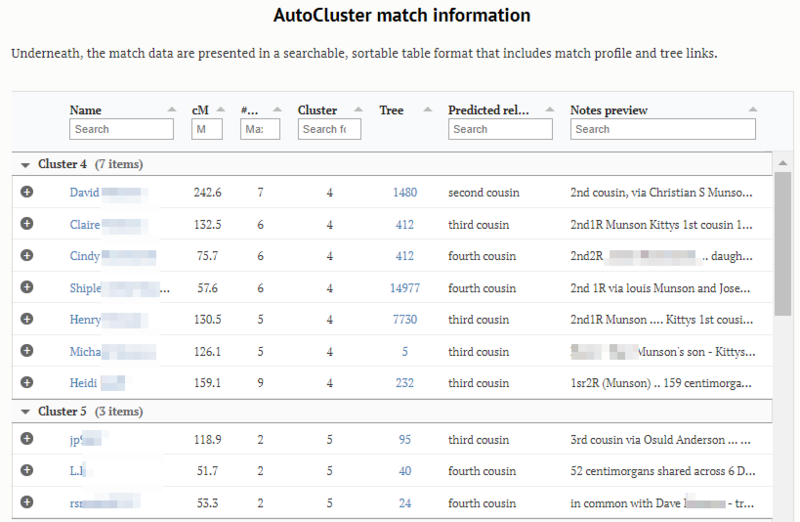 So I clicked through from the charts to each clustered match with a tree, looked where the common ancestor was, and put in the note for that match what the expected relationship now is. I also checked each one in the DNApainter calculator to see if the theory fit. So far so good. The next step is to try and figure out who the son(s) of this couple are. Usually that is via an obituary but I did not find one. So I reached out to a close relative on each side to ask and explained why. We will see if they respond. One logged in yesterday and has a huge tree so I am hopeful. To summarize, the picture is pretty but the charts are an incredible time saver because I can see which matches have good sized trees and can click through to them to test my hypothesis. 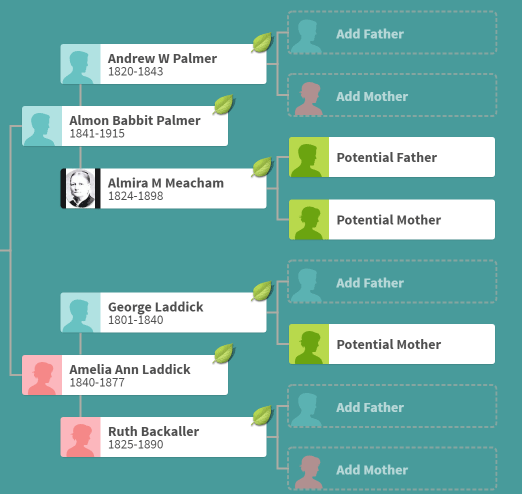 Not every adoptee will have such robust clusters so as to easily find the surnames of each grandparent, but hopefully some will. I hope MyHeritage is added soon. 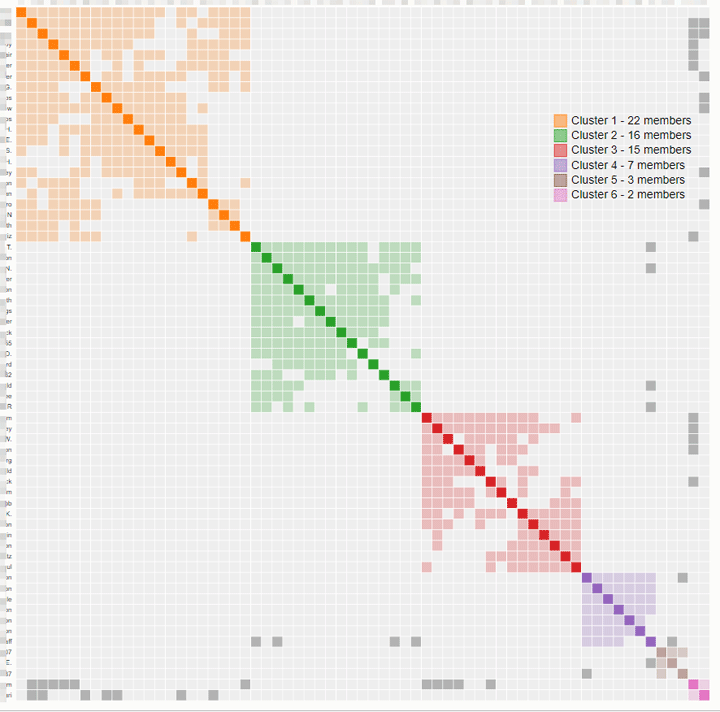 MyHeritage now offers a “new” Cluster tool (Under DNA Tab) on their site. Thanks for sharing this example, Kitty! I love how the Leeds method has been automated and taken to a whole new level. I’ve been working with it over the past day and a half, but can’t wait to learn more. I’d really like to totally analyze my own matches! I love seeing AutoCluster in action! Thanks for this very nice blog post Kitty Cooper. I’ve been using DNA Painter, but this is an amazing tool I’m just now hearing about. Cannot wait to try it out. Thanks Kitty! I knew I could count on you to describe how it works! Has anyone ran into a firewall trying to add their Ancestry acct? Wendell is that what the problem is? GA will NOT take my Ancestry login. I messaged them and hopefully will find out what they think the problem is. Yes TK, I called them and they stated “will not share with 3rd party due to privacy issues”. Blaine said in his FB group that there appears to be a problem today with 3rd party software and ancestry logins…. I did not have any problem adding or running the analysis with my Ancestry account. I have looked through my Ancestry results and they correspond well to what I know about some matches and to the Leeds method. This Clustering looks and sounds pretty awesome. To get started, should I be reading the manual or is it self explanatory via the site, and where? There is a manual? LOL. I was excited to try this and just jumped right in. It was intuitive. I had my results within minutes. I will read any documentation available to make sure I maximize my use of the tool, of course, but the ease of use was a highlight of my first experience with this tool. I’m able to run Auto Cluster for multiple AncestryDNA profiles. I get the emails, save the HTML file to my desktop, open it… and the visual colored cluster is missing in each. All of the other info is there. I can also run this for my 23&Me accounts but I’m not getting email reports for them. I added and set up both websites and am confident the login info is correct. Any idea as to what I’m doing wrong? I read the manual, FAQ, and watched a youtube video. I am also not able to see any colored blocks in my results. It is empty, but there is info on the sides with cluster numbers etc. Were you able to find out why? I am stumped. I received an email that referred to attachment but nothing was attached. Ask the author of the tool – his email is info at the genetic affairs website. For those of you not getting the emails, check your spam folder. That’s where some of mine were. Then whitelist the above email or make a filter (what I did with my gmail account). 23andme has new mapping and “DNA sharing” features that seem very promising. Thank you for evaluating this tool and showing us how it has worked for you. I look forward to learning more about it. The DNAGedcom version works really well. That uses the DNAGedcom Client (paid) to extract the ICW info without causing Ancestry to crash. Really excellent for people starting out. Good for some of my problems and so much easier than doing it by hand for the last 3 months! Also some rather strange assignments – not a fault of the tool; just due to the random way DNA works. As long as you don’t have too many people in your comparison, try reducing cM by 5 (or 10 if very few) and compare again. I am not getting the option to add ancestry, it is completely missing from the choice of websites to add. Has it been removed? or just me. How do I print the page “Auto Cluster Match Information”? Sorry Louise, I missed this comment. As you look at it in a web browser, you would use the print option in that browser. If you don’t know how to print from a browser, ask Google! If I only want to research one branch can I make some criteria for that? I will get thousands of matches for my father’s side. I need my mother’s grandfather. Sorry Toni, I missed this comment. No way to separate. If you know one match that would be in that group, you can search for it on the page to find that cluster. A strategy is to get as many other descendants of your target person to test and then work through their common matches looking for clues. MAJOR CONCERN – Delete Icon Doesn’t Work. I tried Genetic Affairs back on Dec 20th, 2018. I only wanted a trial, and planned to delete everything afterwards. I went in on Dec. 21st, 2018 and clicked the delete icon beside each kit and beside my Ancestry profile. I found that clicking the delete icon did nothing, even after refreshing, each kit and my profile were still listed at Genetic Affairs. I’ve tried a few more times since then, most recently on Jan 16th. I’ve posted to their Facebook group twice now, once on Dec 21st and once on Jan. 16th. I’m seeing that while autocluster questions will be answered, they will not respond with why the delete icon isn’t working or when it will be working. I’m lucky in that I used a 2nd Ancestry account with only contributor level access, so I’ve been able to remove Genetic Affairs access by taking away access to my kits from this 2nd Ancestry account, and changing the 2nd accounts password at Ancestry. However, this makes me worried for those who have given Genetic Affairs accesss to their 23andMe or FTDNA results. Is there a chance you could get a response from Genetic Affairs about why the delete icon isn’t working and when it will be? Facebook is the wrong place to report a problem like this as it may get lost in the multitude. An FB group is more about users helping each other. Thanks for the explanation Kitty. I hope this will help with my two biggest brick walls. I received the email much faster than expected. In it I received a zipped csv file, which opened okay. There were two other untitled .dat files. No 2nd csv and no html, as described in the email, and no indication that clustering didn’t happen. What am I doing wrong? Your email client apparently thought it was a good idea to rename the zip files to dat files. No worries, just download the dat files, rename them to something that ends with .zip and you’ll be able to extract them and view the HTML. We also have a nice user group on Facebook that could be interesting: https://www.facebook.com/groups/319181318684957 Good luck! Are their any other resources to help understanding clustering. I did mine and the algorithm gave seven clusters based off my highest matches on Ancestry. Does this mean NPEs in the tree? Jane, it just means that those matches of yours share a common ancestor with you and each other. Possibly a great grandparent or a great great. Look at their trees for common ancestors with each other and you. If there are groups that have the same common ancestors with each other but not you, then there may be something wrong on your tree, like an NPE.